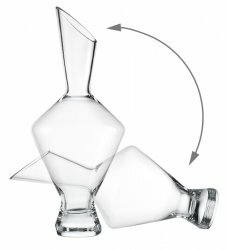 The Up and Down Decanter is designed to stand both vertically and horizontally. Made by Spiegelau this decanter is ideally designed to save space on any surface making it easy to use and store. With its clever and original shape this decanter will make a practical and exciting addition to any dinner table. The decanter is made from lead-free crystal.